This Agreement was last modified on March 27, 2014. 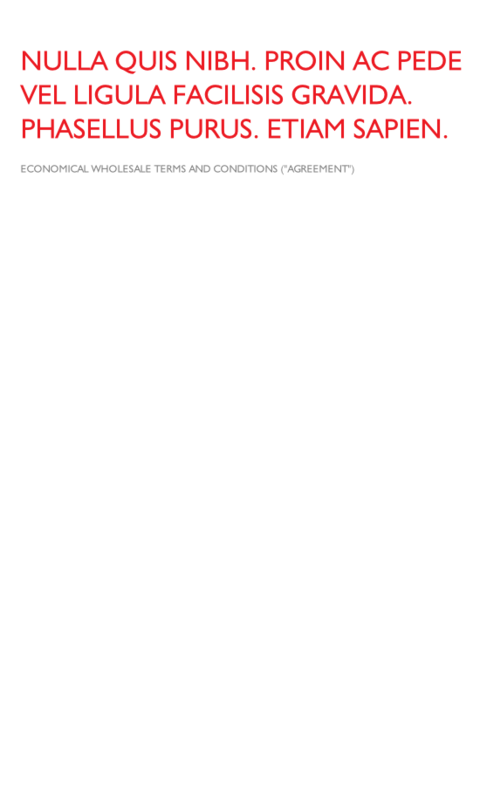 Please read these Terms and Conditions ("Agreement", "Terms and Conditions") carefully before using http://www.economicalwholesale.com ("the Site") operated by Economical Wholesale ("us", "we", or "our"). This Agreement sets forth the legally binding terms and conditions for your use of the Site at http://www.economicalwholesale.com. Intellectual Property - The Site and its original content, features and functionality are owned by Economical Wholesale and are protected by international copyright, trademark, patent, trade secret and other intellectual property or proprietary rights laws. Links To Other Sites - Our Site may contain links to third-party sites that are not owned or controlled by Economical Wholesale. Governing Law - This Agreement (and any further rules, polices, or guidelines incorporated by reference) shall be governed and construed in accordance with the laws of Louisiana, United States, without giving effect to any principles of conflicts of law. Changes To This Agreement - We reserve the right, at our sole discretion, to modify or replace these Terms and Conditions by posting the updated terms on the Site. Your continued use of the Site after any such changes constitutes your acceptance of the new Terms and Conditions.